My four-year-old daughter has a good friend at preschool who happens to have the same name. I'll call them both "Maya." My daughter is Asian, and her friend is Latino. Recently, a classmate said, "There are two Mayas in our class. One is white and the other is brown." My Asian daughter is the "white" Maya. The classmate's mom probed why he categorized the two Mayas this way, but didn't get much of an answer. Innocently, the boy didn't realize why his categorization was inaccurate or unusual. In preschool, children are just beginning to make sense of things, applying lessons and parallels - sometimes accurately and sometimes not - from the world around them. My daughter attends University Settlement Park Slope North/Helen Owen Carey Child Development Center ("Helen Owen Carey"), which manages to maintain a rare balance of racial and income diversity. I really appreciate this aspect of our preschool. Exposure to classmates from a wide range of racial and economic backgrounds is important. Young children need precisely this type of exposure, even if the process by which they come to understand it can be messy. Incidents like the above are awkward, but it's good that my daughter and her classmates are at a school where children can start to take stock of our diverse community. I am glad that Maya's classroom more closely mirrors the population of Brooklyn as a whole, and not just that of our Park Slope neighborhood. Maya and her classmates have unique learning opportunities as a result of their school's student body, both formally and informally. In a lesson themed "All About Me," Maya and her classmates examined their physical appearance including differences in skin tone which they later put on a color spectrum, indirectly allowing the children to consider race. Parents and families can also play an important role in this learning. Each spring, my husband and I go into our children's preschool classrooms to teach mini-lessons about two holidays related to our ethnic heritage, Chinese New Year and Burmese New Year. Even casual exposure can expand young children's sense of the world. My three children have sampled Haitian food at preschool potlucks, learned about latkes and matzo, and shared homemade mochi at their own birthday parties. We need more public school classrooms that look like my daughter's preschool class. The New York City Department of Education's recent decision to allow principals at seven public schools to set aside a percentage of seats for particular categories of students (such as low-income students, English Language Learners, or those involved with the child welfare system) in the interest of school integration is a promising and needed measure. Once a more diverse study body walks through the classroom doors, however, a new and more intensive challenge begins – that of educating students of widely varying backgrounds and building a community from these children and their parents. And while it may be simpler to work with kids with roughly the same background and starting point, we know the value of a more diverse learning environment for everyone involved. Parents in a racially and economically diverse school do face unique challenges when negotiating relationships and building community at those schools. For the most part, parents – including myself - at our preschool socialize more with others like themselves – racially, economically, or otherwise. This unfortunate segregation occurs politely and all too naturally, despite good intentions, and persists although many Park Slope parents chose the school precisely because of its diversity. However, I have observed how we all grow more comfortable with one another over time and shared experiences. We nod "hello" when we run into each at drop-off or pickup, racing to avoid the dreaded late drop-off or pickup that occasions a visit to the administrative office. Parents share tips about the kindergarten application process, often in groups wider than our social circles. And so on. Community building is tough, especially within diverse communities, even when this very diversity is what drew you into that community in the first place. I am thankful for the chance to participate in Helen Owen Carey's community. Maya's older brother now attends PS 321, a popular and sought after public elementary school in Park Slope. I've been satisfied with the caliber of instruction he's received there and appreciate the school's deeply engaged parent community. Unfortunately, it lacks the diversity I so love about our preschool. My children have been exposed to a level of diversity before entering kindergarten that they may not experience again in New York City public schools – maybe in their educational careers. That alone is priceless. I benefit from the fact that my son's elementary school is a one mere block from my apartment, and the fact that playdates with my son's classmates are easy to arrange because everyone lives within five minutes. I have enjoyed getting to know many of his friend's parents, with whom I have a lot in common. That said, there is value in exposure to – and perhaps even building a more tenuous relationship with – parents with whom one does not have a lot in common and most likely will never become close friends with. Learning about other parents' experiences and the challenges they may face has expanded both my sense of the privilege I enjoy, as well as my broader understanding of educational equity. As for my three children, as much as I appreciate the fact that we are zoned for PS 321 and what that means for their educational foundation, I hope they will not only reap benefits from their time in preschool but have more opportunities for rich, demanding, and diverse educational experiences in public school and beyond. A good preschool friend of my son lived far away in another part of Brooklyn and is from a working class background. I didn't get to know his parents beyond the usual salutations and pleasantries, and we have not kept in touch. But I hope my son will remember his old friend should he meet other kids who remind him of the friend and that this will help my son keep an open mind and heart to others from different racial and income backgrounds. This hope might be impossibly idealistic, but it is ultimately what we need to achieve from school integration. Khin Mai Aung has three children aged two, four, and six who attend preschool and public school in New York City. Previously, she was Director of the Educational Equity Program at the Asian American Legal Defense and Education Fund, and she currently conducts civil rights enforcement for the state of New York. The views contained in this article are solely her own. With education a top priority for the city, it's critical that our leaders take strong action to address the chronic underfunding of our city's school infrastructure. Key to addressing this issue is investing sufficient capital resources in the city budget, as well as improving the current school planning process, which is broken. Recently, we've had some good news. When the city Department of Education (DOE) released its school capital plan, it included a commitment from Mayor de Blasio to invest nearly $900 million in additional resources to build more school seats. In the same plan, the DOE raised its needs assessment to 83,000 additional seats, given enrollment projections and existing overcrowding. This is closer to the 100,000-seat figure that Class Size Matters estimated in its recent report, "Space Crunch." Together, these two adjustments are a welcome acknowledgement of the crisis in school overcrowding, and we applaud them. But more should be done. The number of new seats in the capital plan is 49,000—only about 59 percent of the DOE's own admitted need—and New York City's population is growing faster than any other large city in the nation. The mayor is now urging the City Council to adopt rezoning plans to accelerate the construction of thousands of new affordable and market-rate housing units, which will increase pressure on our school system. At this critical moment, the city has a real opportunity to address housing and education together. Right now, more than half a million students are crammed into over-utilized schools, according to DOE data. In many cases, this means excessive class sizes of 30 or more, a loss of art, music, or science rooms, and a lack of dedicated spaces for students to receive counseling or mandated special education services – no less the wraparound services inherent in the community school model. 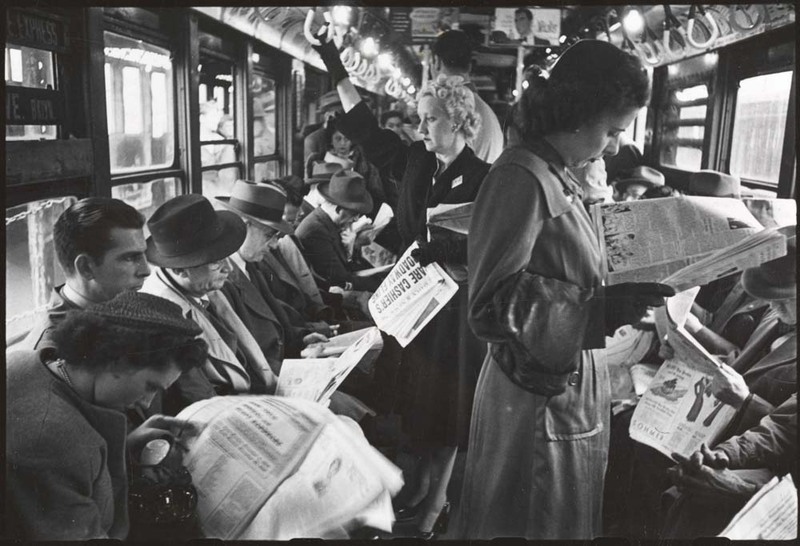 According to the analysis in a recent report by Make the Road New York—"Where's My Seat? "—immigrant communities have especially egregious overcrowding problems and even greater unmet needs in the DOE capital plan. In many of the schools in these neighborhoods, children are forced to eat their lunch as early as 10 a.m. or are bused to schools far away from their homes. Many do not have adequate opportunity for physical education because there is not enough space in their gyms. We need to build, lease, and expand more schools. At least the 83,000 seats that the DOE projects are necessary. 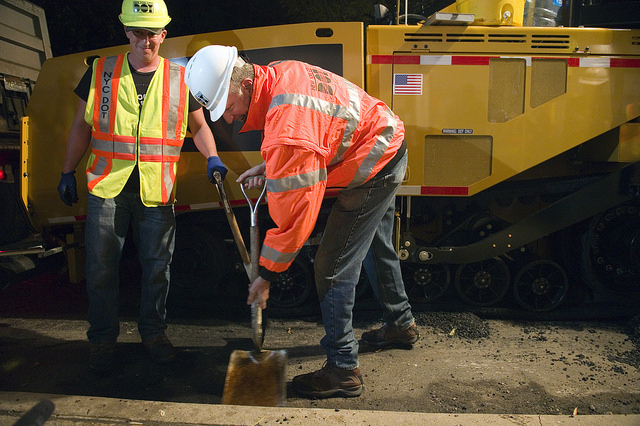 In addition, the process of school planning and siting must be made more efficient. 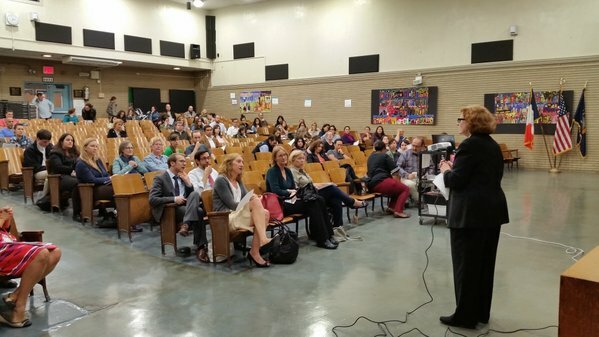 There are many communities, like Sunset Park, which have suffered from extreme overcrowding for a decade or more, even though funding to build more schools in the neighborhood has existed in the capital plan, because the School Construction Agency has not been able to site a single one. According to the DOE, only 15 percent of the school seats needed by 2019 have sites identified and are in the process of being designed. In seven districts, that percentage is zero. The city will fall even further behind in creating seats if the mayor's rezoning proposals are adopted, unless much more is done to build and site schools. A recent Environmental Impact Statement for the East New York rezoning proposal found it would exacerbate school overcrowding, and, along with other changes, drive high school overcrowding in the borough to 109 percent of capacity. Yet the DOE capital plan does not include a single Brooklyn high school to be built. That is why we are urging the City Council, along with the mayor, to create a commission or task force of experts and stakeholder groups, to propose reforms to the school planning process, so that schools must be built along with housing, instead of decades afterwards. Among the issues to be considered would be reforms to the zoning process, including whether the threshold to consider the need for a new school should be lowered – especially when the schools are already overcrowded; whether the formula used by City Planning to estimate the impact of new housing on schools needs to be updated; whether the city should require impact fees from developers and/or use eminent domain more frequently; and how the trends in lost seats, utilization rates, and enrollment could be made more transparent and more accurate through regular reporting by the DOE. As Mayor de Blasio repeated in his recent State of the City speech, the goal across our city must be to ensure that neighborhoods thrive. There cannot be successful neighborhoods unless there are schools with enough space for the children in every community across the city to learn and prosper. It's time to invest all the necessary resources and improve the school planning process to ensure the bright future that all of our children deserve. Leonie Haimson is the Executive Director of Class Size Matters. Javier H. Valdés is the Co-Executive Director of Make the Road New York. On Twitter: @leoniehaimson @javierhvaldes. The past several months have been one of the most tumultuous periods in New York State's educational history, culminating several years of false starts and disarray in education policy. It's not without precedent, though, and history has valuable lessons for New York today. In December, President Barack Obama signed the Every Student Succeeds Act, replacing the 15-year old No Child Left Behind Act and sweeping away its emphasis on standardized tests and punitive approach to failing schools. The new law returns power to the states and dilutes the federal government's power to impose educational standards. That will loosen the hold of federal requirements on New York's educational policy. 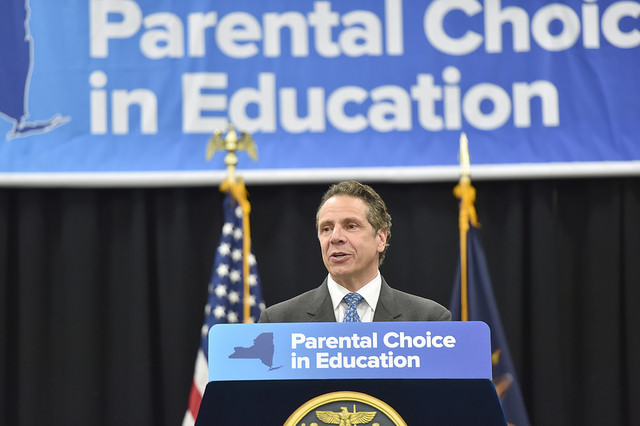 Also in December, Governor Andrew Cuomo announced and endorsed the report of his "Common Core Task Force," which had been charged with evaluating the rollout of Common Core educational standards, which the federal government had supported. 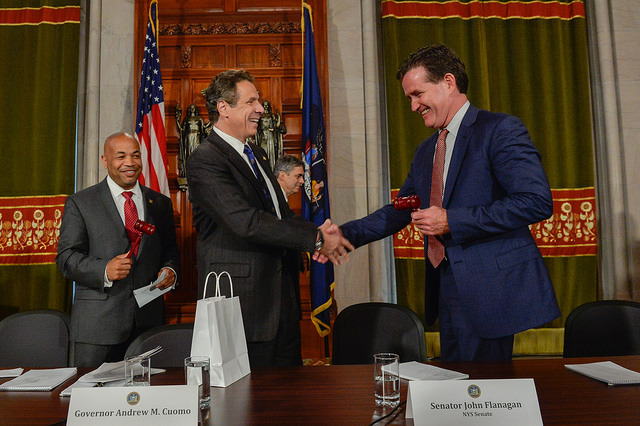 The task force recommended adopting new, locally-driven New York State standards and, as the governor noted, "greatly reducing testing and testing anxiety for our students. The Common Core was supposed to ensure all of our children had the education they needed to be college and career-ready – but it actually caused confusion and anxiety. That ends now." At the same time, the Board of Regents approved a four-year moratorium on using student scores on state standardized tests as part of the teacher evaluation system, something teachers had protested (local tests will still be used, though). The Regents' suspension of the policy is in line with another recommendation of the governor's Common Core task force. The governor had also endorsed use of student test scores in teacher evaluation, a position he has also now abandoned. The Regents adopted the Common Core some years ago and required its use in the schools without providing the necessary implementation materials or training for teachers, and mandated exams on material that had not been fully covered in the classroom. Teachers protested that the process was too rushed and opposed using the test scores in their own job evaluations. Thousands of parents joined an "opt out" movement by refusing to let their children take the exams. The embattled state commissioner of education, John King, who oversaw the rushed rollout, left for a post in Washington, D.C. His successor, MaryEllen Elia, has promised a more thoughtful and responsive approach. New York's per-pupil spending is among the highest in the nation but there are constant reports and press stories that our graduates are not adequately prepared for the workforce or college. In the meantime, over the past several years New York has established a second network of publically-funded schools called charter schools, paralleling and often competing with its traditional public schools, with mixed results. After years of disarray, we are (or should be) at a turning point. It is time for a fresh look at education policy in New York. Gov. Cuomo, in his State of the State address on Jan. 13, proposed changes, but relatively limited ones. Referring to criticism in his common core task force's report of "common core curriculum implementation mistakes and testing regimen," he said that "we urge the state education department to do it right this time." He supports increased school aid, expansion of charter schools, and more support for "failing" high-needs schools, including through the community schools program. Those are significant, but they are modest; mostly more funding and a do-over of the common core rollout, well short of new departures. This could be a time of opportunity for major changes to strengthen education in New York. But that would require bold, imaginative leadership. Over the years, history suggests, New York periodically worries about, analyzes, and occasionally takes dramatic initiatives to strengthen its educational system or move off in substantially new directions. *New York commits to public education. In 1812, after earlier plans to stimulate the establishment of public schools (or "common schools" as they were called then) had failed, the legislature passed the Common School Act of 1812. It created a state superintendent of public schools, outlined a process for creation and operation of local school districts, provided that the voters in each district would elect trustees to operate the schools, established a system of local revenue raised by towns and counties matched by state aid to support the schools. The act established three precedents: public schools are a function of the state; they are to be locally administered with state oversight; and funding is a joint state-local responsibility. Article XI of the current state constitution reflects the state commitment established back in 1812: "The legislature shall provide for the maintenance and support of a system of free public schools, wherein all the children of the state may be educated." *A governor initiates consolidation and streamlining of state educational policy. New York entered the 20th century with responsibility for educational policy scattered between the state Department of Public Instruction (successor to the Superintendent of Public Schools established in 1812) and the Board of Regents, established years earlier mainly to oversee higher education. Governor Theodore Roosevelt (1899-1901), a Republican, appointed a study commission which recommended consolidation of educational oversight in a new State Education Department under the Regents. "The plan proposed is simple, effective and wholly free from political or partisan considerations," Roosevelt said, optimistically, in a message to the legislature in 1900. However, partisan bickering and procrastination stalled action until 1904 when, during the tenure of Roosevelt’s successor, Republican Governor Benjamin B. Odell, Republicans in the legislative majority drew up a bill to implement the recommendation. But Democrats denounced the bill, in part because Republicans had proposed it. Democratic Assembly Minority Leader George Palmer called it "the most vicious...partisan legislation offered before this body in the last decade." The bill passed by a strictly party vote, except for one Democratic assemblymember who broke ranks to vote for it. But it launched New York onto a new educational path. *A Commissioner of Education charts a new course for education. New York's first Commissioner of Education, Andrew S. Draper (1904-1913), took charge of educational policy. "The public school system has come to be the main hope of our nation," he wrote in his book, American Education, in 1909. "In this American system of schools the predominant characteristics of our future American citizenship are being, and must continue to be, developed." Schools should be expected "to give every child not only the means of informing himself and of expressing himself, but also a definite trade or vocation through which he may earn a living." Like most effective commissioners since then, he recommended policy actions to the Regents, worked for their approval, and then vigorously implemented them, rather than waiting for the Regents to tell him what to do. Draper raised standards, adjusted the curriculum to ensure students received instruction that would make them job-ready and also effective citizens, clarified and strengthened the roles of local principals and superintendents, and pushed for school consolidation. He supported stronger teacher training and established a statewide teacher retirement system. Draper's initiatives strengthened and elevated education. *A governor dramatically increases state aid for education. State aid to schools was meager in the early 20th century. Governor Alfred E. Smith (1919-1921, 1923-1929), a Democrat, championed public education and pushed for more school funding. When the Republican-controlled legislature balked, Smith appointed a Commission on School Finance and Administration headed by a prominent civic leader and businessman, Michael Friedsam, president of B. Altman & Company department store in New York City, which recommended a substantial increase in state funding in 1926. The Friedsam report resulted in a good deal of public support for substantially increased aid to education. But the fiscally tight-fisted legislature refused to act on the report. Smith made education aid a priority in his successful 1926 re-election campaign, denouncing his political opponents' "cheap political tricks" and "underhanded propaganda." The 1927 legislature raised funding to $82,500,000, a significant increase. But in a political swipe at the governor, legislative leaders announced that this was $2 million less than Smith's request, an indication, they insisted, of the legislature's fiscal frugality. *The Regents revamp education policy. By the early 1930s, educators were complaining that curricular requirements were outdated, employers asserted that public education was not adequately preparing students for jobs in business and industry, and many taxpayers thought that education had become too costly. The Regents responded by launching a searching analysis, The Regents Inquiry into the Character and Cost of Public Education, in 1935-1938. When the legislature showed reluctance to fund the study, the Regents secured support for it from the Rockefeller Foundation. The study was headed by highly respected Regent Owen D. Young, who was also chief executive officer of General Electric. It was carried out by recognized experts in education and public policy. The inquiry issued a summary report and ten supplemental reports on specific topics. Youths leaving high school "are not adequately educated...not prepared to play a helpful part in the life of this state," the report said. The school curriculum "has not been designed to fit them for the new and changing work opportunities which they must face in modern economic life." The report recommended more technical and vocational training to impart "immediately marketable skills" and "character education," training in civics and citizenship, and many other curricular changes. The Education Department should relax its regulatory oversight over the schools, allow greater local school board autonomy, and concentrate on identifying and disseminating modern educational practices to the schools, it said. The report also recommended stronger teacher training programs, higher salaries and expanded tenure protection to attract more and better teachers. The report was a wellspring for substantial changes in education policy, practices, and curriculum over the next decade. The past few years of education policy disarray, and the historical examples outlined above and others that might be cited, suggest five insights for shaping New York's future educational plans. One, leadership is critical, and it can come from the Governor, Regents, Commissioner of Education, or key legislators. Two, for many years New York's educational system was regarded as among the best in the nation. Regents exams and degrees were something approaching a gold standard in education. Those were years before substantial federal involvement in education, before externally-created standards such as common core, and before a continual barrage of proposed educational reforms from outside think tanks such as the Gates Foundation. New York leaders acted on New York reports on the state's needs and opportunities. This might argue for returning to a system of more reliance on New York's own educational experts and less on outsiders. Three, a carefully-compiled, visionary, thoughtful analytical report, describing current conditions, setting forth a vision, and outlining a preferred course of action, can inform and streamline the process of reaching a consensus and taking action. Four, sometimes a bold, innovative, mostly unprecedented new approach may be needed, e.g., a new way of preparing and evaluating teachers, more robust and imaginative integration of educational technology and social media in education, more sharing of resources between schools (for instance, courses taught over the web), different forms of evaluation, or a new way of funding public education. Five, whatever is proposed and enacted will require years to be implemented, take root, and have a measurable impact. 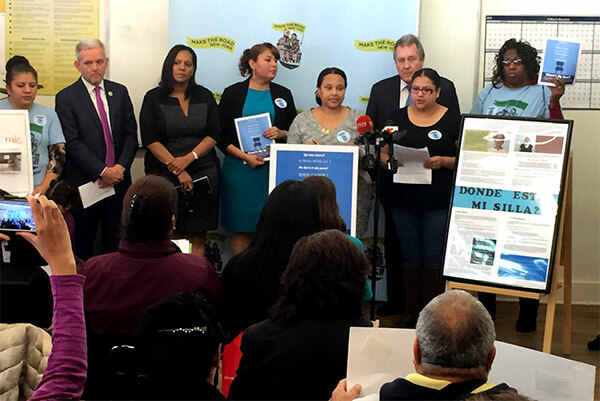 For years, advocates and community based organizations have urged the New York City Department of Education to increase translation and interpretation services to public school parents and guardians with limited English proficiency. 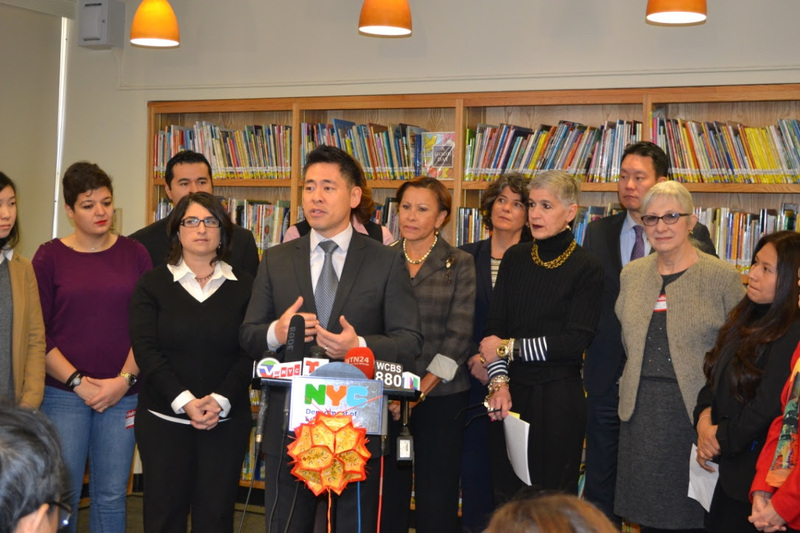 Last week, I was honored to join schools Chancellor Carmen Fariña, a true champion for the immigrant community to announce a series of initiatives aimed at easing language access for parents in schools. Immigrant families face tremendous obstacles – speaking to their child's teacher or principal should not be one of them. With nearly half of public school students – almost half a million families – speaking a language other than English at home, it is essential that these families have the ability to participate in their children's school lives. That's why the New York Immigration Coalition and our Education Collaborative of member organizations representing Asian, Arab, Caribbean, African, Latino, and other immigrant families, launched our "Build the Bridge" campaign that advocated for increased translation and interpretation for immigrant parents. And we are grateful that the DOE has stepped up and heard our calls. The city's language access expansion efforts are a significant step that will help notably reduce language gaps in our schools. The expansion includes the creation of nine new full-time positions in the Borough Field Support Centers and Affinity Groups that will determine the specific needs of each school, and build the necessary supports so that parents receive quality translation and interpretation services. The expansion also includes new direct access to over-the-phone interpreters available after 5 p.m. In the past, schools had to contact the Translation and Interpretation Unit, which then connected the call – a step that has been eliminated. This will help reduce wait time for an interpreter, and allow teachers and staff to call non-English speaking families after business hours. Interpreters are available in 200 languages. In addition, starting this month, members of the Citywide and Community Education Councils will also receive additional language support. We want our elected parent leaders to be representative of our diverse school system and want to make sure they are able to communicate among themselves and with others no matter the language they speak. Having the ability to communicate with parents in a language they understand and in a timely fashion is key to the DOE's work. We will keep up our efforts to ensure that immigrant students and parents are provided with culturally competent services to further strengthen this bridge to immigrant families that the DOE, with help and support from advocates, has built. We celebrate this groundbreaking accomplishment and thank Chancellor Fariña and the DOE for their continued efforts to improve services for immigrant families all across our great city. by Steven Choi is Executive Director of New York Immigration Coalition. On Twitter @stevechoinyic & @thenyic. This summer saw the city’s street homeless population become a tabloid sensation, with Mayor de Blasio seemingly forced into addressing the increase in homeless people on New York sidewalks. With shelters overflowing despite the city opening dozens of new ones, and a typical warm-weather increase in those who prefer the street to the often dangerous conditions of those shelters, the mayor announced several emergency measures and appears to be at least slightly stemming the tide. Yet, the dawn of a new school year brings into stark relief perhaps the most tragic aspect of the city’s homelessness crisis: some 84,000 children in the public school system are homeless or in temporary housing, and many of them are struggling in school. A new Independent Budget Office report shows a 63 percent rise in student homelessness over the four school years ending with 2013-2014, posing a major challenge for a mayor who says that “education determines a child's destiny.” While de Blasio and his commissioners open new shelters and new community schools, enroll more homeless youth in school, increase funding for eviction protection, and up outreach to families facing loss of housing, the deck continues to be stacked against homeless students. The troubling number of 84,000 homeless students stems from a recent report on the 2013-2014 school year by the Institute for Children, Poverty, and Homelessness (ICPH). Written in conjunction with the city Department of Education and its Students in Temporary Housing Unit, the study outlines the regional severity of the problem in order to magnify its educational consequences. In the worst cases, 40 percent of a school’s student body can be homeless - which here is defined as being in a shelter or doubled up with another family. For the eight most affected school districts the rate hovers between 13 and 17.6 percent. In more affluent areas the problem is largely muted, but no city school district has a homeless rate of less than two percent. Regardless of where they live and go to school, the ICPH report makes clear that homeless children face constant barriers to academic achievement. Homeless children often struggle to maintain consistency, cannot read at grade level, and are behind their housed peers on virtually all measures of educational aptitude. These gaps are not by small margins either. Homeless children are three times more likely than their housed peers to be placed in special education programs, four times more likely to drop out of school, eight to nine times more likely to repeat grades - approximately one in ten are held back each year - and twice as likely to score poorly on standardized tests in math and reading. Learning gaps between homeless and securely housed students only grow larger with age. Much of the gap results from poor attendance. In the 2013-2014 school year, 38 percent of homeless students were chronically absent, meaning that they missed more than 20 days of school - approximately one month of school. In a recent interview with BronxTalk, Abelardo Fernandez, co-director of South Bronx Rising Together (SBRT), a community coalition targeting disadvantaged youth, pointed out the absurdity of expecting kids to do well under such conditions. “We can‘t really talk about third grade reading or eighth grade math...unless we can make sure that kids are coming to school every single day,“ Fernandez said. A large part of homeless absenteeism is simply that kids cannot get to school. In another ICPH study (this one focusing on the 2011-12 school year) 43 percent of homeless respondents listed transportation as a major obstacle to school attendance. This problem should already be accounted for. The McKinney-Vento Act, the foremost piece of federal legislation concerning homeless children, is supposed to “ensure that homeless children and youth have transportation to and from their school of origin.“ Yet federal funding is limited - $1.5 million annually to New York City for the DOE's Students in Temporary Housing Unit - and across the city it is clear that this need is not being met. While the Department of Education technically fulfills its legal obligation by giving each homeless child or parent of a young homeless child a Metrocard, the truth is that in many cases this is simply not sufficient. The result: homeless students transfer schools at a rate far beyond that of housed students: three times as often. Homelessness can lead to multiple school changes: one-fifth of homeless students transfer schools twice or three times in a year. Continually ripped away from their communities, homeless children face nearly insurmountable educational and psychological setbacks. A report from the U.S. Department of Education estimates that each school transfer is equivalent to six lost months of school. Social ramifications are often felt even harder by the child than academic ones. Transferring schools doesn’t just mean readjusting to new teachers and curriculum, it also means losing entire support networks - friends, coaches, mentors. The psychological weight of ongoing insecurity is crippling: 47 percent of homeless children experience intense levels of anxiety, depression, or symptoms of social withdrawal, according to the National Center on Family Homelessness. Teachers will work with students who come to them mid-year, but this slows down a classroom in which students are frequently already struggling to read or do math at grade level. Challenges are compounded: homeless students struggle because they are uprooted from their educational home and thrown into struggling schools, which are struggling because they serve high percentages of high-needs students. These schools often tend to have the highest rates of teacher turnover. 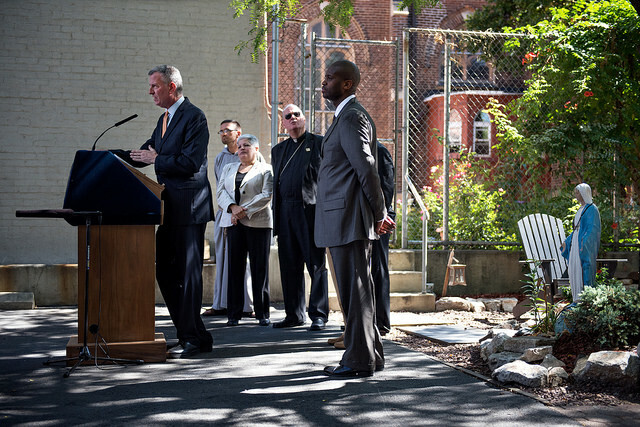 Mayor de Blasio has tried to alleviate some of the weight on the shelter system and is having some success, albeit small. His eviction-prevention programs have helped thousands of families keep their homes and through his Living in Communities (LINC) program the administration moved 1,553 families out of homeless shelters over an initial eight-month period ending in May. Yet the shelter vacancies left by these few departures are often quickly filled: 49,000 children and their families loom just outside the shelter system, “doubled-up” in close quarters staying with sympathetic family or friends. In trouble and often just barely able to secure a place to sleep because of the children’s school needs, these families teeter on the edge of family shelter life, which is often a worse alternative to an overcrowded apartment. “You go and you stay with some family for a while, you stay with another family for a while, and the probability of eventually ending up in a shelter is very high,” said Ralph da Costa Nunez, President and CEO of ICPH, in an interview with CUNY-TV. In an overcrowded apartment, he points out, all it takes is an argument among residents or a suspicious landlord “checking in” on his tenants, and everyone can be out on the street. Instead the mayor and his team must search for a way to give homeless students a fighting chance. Schools Chancellor Carmen Farina is at the front lines of having to figure out how to help homeless students. The academic fate of homeless students is part of her responsibility as the leader of a school system with 1.1 million students in 1,800 schools. This work is taking place at many of the city’s “Renewal Schools,” which have emerged as both a social and political battleground. On one flank, de Blasio, Fariña, and their staffs are fighting dismal attendance and homelessness rates; fifty-one of the 94 Renewal Schools are located in the seven districts with the highest concentration of homeless students. On the other, they eye Governor Andrew Cuomo and Senate Majority Leader John Flanagan, who will formally re-evaluate de Blasio’s mayoral control of city schools again in 2016, after giving him just a one-year extension. The assessment of de Blasio as an education mayor will in large part be based on Renewal School performance. It is a control that de Blasio is desperate to maintain. “I can tell you that none of the big changes we have made in our schools, and none of the changes we are going to make, would be possible without mayoral control,” he argued in his recent “Equity and Excellence” education speech. Knowing that they must address student homelessness and the educational attainment of homeless students in their turnaround plans, Fariña and de Blasio have launched a slew of programs. Among the most prominent of these efforts are the massive expansion toward universal pre-kindergarten and middle school after-school programs, and the Community Schools Initiative, which brings additional resources, including medical services, into school buildings to support children and families. Most of the renewal schools are part of the community school program. After-school programs give homeless students a space away from crowded, chaotic shelter environments to do homework and participate in enrichment programs, and they supply parents with extra time to search for employment and housing. The Community School Initiative focuses on removing many non-academic barriers to educational success (though not transportation). At P.S. 15 in the Bronx, for instance, the school has installed laundry machines to help ensure kids do not have to come to school wearing dirty clothes. It is also a way to get parents into the school building. “Some schools might have a food pantry so hunger doesn’t distract from learning,” de Blasio said, while others, he says, have established mental and physical health services to deal with their disproportionately sick and undertreated populations. And, the city announced a public-private partnership with Warby Parker whereby students at community schools are able to access eye exams and free glasses. Fariña has been busy fostering a partnership with Department of Homeless Services Commissioner Gilbert Taylor. In an interview with Gotham Gazette, DHS representative Jaslee Carayol laid out the details of the interdepartmental collaboration. And in August, the two departments—along with NYS-TEACHS—held “2015 Back to School Education Summit,” a conference aimed at facilitating a higher level of correspondence and knowledge between DHS shelter providers and the DOE staff assigned to work in shelters. All these efforts are encouraging to homeless advocates. “They‘re listening,“ Nunez replied when asked what the de Blasio administration is doing differently from its predecessor. Still, there are major obstacles to stopping more young people from becoming homeless and to ensuring that homeless students are able to learn. De Blasio is frustrated by skyrocketing housing costs and persistent homelessness rates. He’s stymied by a lack of state and federal aid and though he has an ambitious affordable housing plan, it is just getting rolled out. “The market dynamics here are forcing people out faster than all of our tools can compensate,” the mayor said in a recent interview with the Daily News editorial board. If there is some hope in the student homelessness crisis, it is that the population is disproportionately young. “A little more than half of all children in the shelter system are under six…That’s your opportunity!” says Nunez, of the Institute for Children, Poverty, and Homelessness. The heavy proportion of young students applies to the public school system as well: 43 percent of unhoused students are in third grade or below. If the city is able to implement worthwhile changes and move quickly enough, its actions could have an especially potent effect. Nothing new here. Homelessness will not decrease if there are not enough affordable homes. Student homelessness, the affordability crisis, and their effects on student learning are so staggering Chancellor Fariña suggested using public high schools as student dormitories back in 2013. "We need to turn some of our large high schools into dormitory schools," she said at a conference, before she was named chancellor by de Blasio. Highly unlikely, a much more plausible solution would be to ensure the development of low-cost residencies, which is at the heart of de Blasio’s housing plan. Some, though, point out that even “affordable” units are too expensive for many New Yorkers living in poverty, some of whom work full-time. Although the mayor has pledged to create or preserve 200,000 units of affordable housing over ten years, the problem, as Brooklyn College sociologist Alex Vitale put it in a recent Gotham Gazette column, is that almost none of them will be affordable to homeless people. One key to housing, though, that many point to is simply a continued boom in residential building, as more units on the market may let some air out of the supply-demand problem leading to ballooning prices. This is part of de Blasio’s push to rezone a variety of neighborhoods across the city to allow for greater density. Part of the rezonings will be a commitment from developers for “affordable” units. The question will continue to be if they are affordable enough for the types of families facing homelessness. Still, Alyssa Aguilera, political director of VOCAL-NY, a grassroots community organization, wrote recently, also at this publication, that Mayor de Blasio must simply “demand more dedicated housing for the homeless from developers reaping massive profits through tax subsidies and land deals.” She, like many others, also sees Governor Cuomo as having an essential role, calling on him to fully fund tens of thousands of units of supportive housing, under a NY/NY IV agreement. Dr. Ralph da Costa Nunez sees better shelters, not more affordable housing as the most effective route to properly supporting homeless children. He advocates for the idea that shelters need to be turned into community resource centers with a residential component. Even though the Department of Education and the Department of Homeless Services have teamed up several times recently, there’s room for the two departments to be more coordinated. For one, the two departments count homeless people in different ways. While DOE includes doubled-up families and unsheltered people in their tally, says Nunez, DHS only counts the people registered within its shelter system. The figure of 84,000 students without stable housing is not one that DHS recognizes, instead it puts forth the number of children sleeping in homeless shelters, which is around 28,000. This would involve several things, including “a much more deliberate attempt to place families in shelters located close to the communities of origin.” If there are not any local shelter spots—which is often the case—Pringle suggests flagging families with children as first for any spots that do open up. She also suggests that families in cluster units—apartments in regular rental buildings used by DHS to house families—receive more direct educational counseling services. While a Students in Temporary Housing liaison from the DOE is stationed in every shelter, these liaisons are often difficult to access for families put in cluster housing. “Homelessness is a structural problem,” de Blasio said when talking with the Daily News editorial board. Elizabeth Clay Roy and Abelardo Fernandez, co-directors of South Bronx Rising Together--a coalition of government, business, and community leaders--have this concept as central to their approach. “We are really focused on making sure this is a cross-sector initiative,” Ms. Clay Roy told Gotham Gazette of the community-based work the organization is doing in some of the most impoverished territory in the country. In an attempt at systemic change, SBRT employs a method known as “Collective Impact...in which local institutions, community-based organizations, higher education, business, philanthropy, the government, and the public join together around a common vision and hold themselves accountable for achieving shared outcomes.” In Clay Roy’s and Fernandez’s case this means addressing the civic and social challenges of Bronx Community District 3. SBRT’s Leadership Council is a key example of the Collective Impact design. Including professors from surrounding colleges, representatives from the DOE, NYCHA, Jobsfirst NYC; Bronx Borough President Ruben Diaz Jr.; the city’s Community Schools Director Chris Caruso; and a host of nonprofit leaders, the panel of experts works to provide “strategic direction” to come up with solutions for the issues SBRT cares about most: child health, early education enrollment, success in school, positive community engagement, graduation rates from high school and college, and post-collegiate employment. The ideas that come from this body, Clay Roy explained to Gotham Gazette, are then implemented through partnering community organizations and businesses. To help with their recently announced school attendance initiative, for instance, SBRT has enlisted Kinvolved, a tech company that works to increase communication between family and schools. The SBRT dream is for its collaborative network to develop the community’s young residents into powerful, educated community leaders. Yet as part of the poorest Congressional district in the nation--63.1 percent of children in SBRT’s target area are born into poverty--South Bronx Rising Together faces steep challenges. One demographic central in this challenge is homeless students. Spanning school districts eight, nine, and twelve--respectively ranked tenth, first, and second in concentration of homeless students--the 1.6-square-mile area SBRT covers includes seven of the city’s 94 Renewal Schools. If SBRT can help break through in Community District 3, the model is likely to be successful elsewhere. Although the coalition has yet to release any concrete results, its “Collective Impact” strategy does have a history of success. The national organization StriveTogether has implemented the model to favorable results in multiple locations across the country. One of these places happens to be Cincinnati, the city whose “community learning centers” inspired Mayor de Blasio’s Community School Initiative. Senate Majority Leader John Flanagan has made it no secret that he lacks confidence in Mayor Bill de Blasio's handling of the New York City schools. Made clear when the state recently extended de Blasio's control of city schools for just one year, on Monday in a New York Post op-ed Flanagan sent another shot across de Blasio's bow. Seizing on The Post's reporting about grade fixing in city schools, Flanagan reminded de Blasio that he not only expects the mayor to make himself available for hearings, but wants to see major improvements in the education system before he considers renewing mayoral control again next year. "There are still unanswered questions about de Blasio's plan to fix New York City's 91 failing schools and the city's commitment — both financial and otherwise — to the students who attend those schools," wrote Flanagan. "Before we move forward, the mayor and chancellor must agree to hearings so we can examine this grade-fixing scandal and mayoral control...[R]eal reforms must be enacted before mayoral control can be extended any further." Flanagan, a Republican from Long Island and former chair of the Senate education committee, published his column in the middle of an escalating feud between Gov. Andrew Cuomo and de Blasio and months before the start of next Albany legislative session, which is sure to be dominated by political posturing in preparation for the 2016 elections when the entire legislature will be on the ballot. Last year, rather than renewing mayoral control for multiple years as it had under Mayor Michael Bloomberg, Senate Republicans teamed with Cuomo to limit the extension to just one year. Though Cuomo and de Blasio are both Democrats, they have differing philosophies on education, with Cuomo supporting the so-called education reform movement and supporting the expansion of charter schools. Both Flanagan and Cuomo have indicated they want to see significant improvements from city schools under de Blasio. "Next year we can come back, and if he does a good job, then we can say he should have more control," Cuomo said of de Blasio and mayoral control of schools at a press conference in July. The Cuomo administration did not return requests for comment for this story. The posturing by Cuomo, Flanagan, and others begs questions: How much improvement can possibly be seen in one year? And exactly what kind of data points would demonstrate it? When asked what would constitute significant improvements for Flanagan, spokesman Scott Reif, of the Senate's Republican Majority, referred Gotham Gazette back to the op-ed. Reif also said he expected the Senate's education committee to get deeper into the details in the next session. Reif stressed that de Blasio must make himself and city education chancellor Carmen Farina available for hearings. Flanagan wrote in his op-ed that de Blasio only agreed to make Farina available for an hour last year. Leading up to the one-year extension, the de Blasio administration said that Flanagan failed to return the mayor's calls and was combative. De Blasio administration officials stress that they think mayoral control should be judged over the long haul as a governmental system, not on incremental progress over a short period of time made by one mayor or the other. Administration officials say Flanagan's office has not communicated any specific concerns they want addressed, or benchmarks they want hit. Senate Republicans did propose a host of changes to the system in bills last year, including one that would have given the legislature the ability to approve the city DOE budget. That measure is totally unacceptable to the de Blasio administration and did not fly with Assembly Democrats, who are more aligned with the mayor. The administration clearly views Flanagan's position on mayoral control as designed to hurt the mayor rather than to boost the city's educational system. They point to a week's worth of New York Post articles attacking the DOE and Flanagan's op-ed as a strategy designed to blunt the good news contained in the test scores revealed this week. 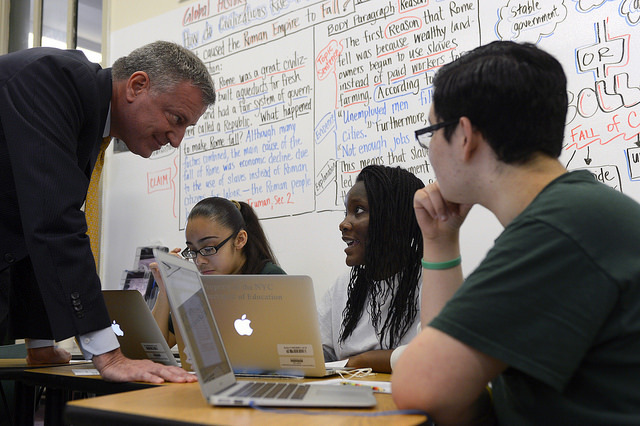 On Wednesday, de Blasio and Farina announced that the city's students in grades 3-8 have made improvement on Common Core-aligned English and math tests. In touting mostly across-the-board gains, they also noted that 41 of the city's 63 struggling "Renewal Schools" saw an increase in their English scores and 36 saw an increase in math. These schools, identified by the state as the most unsuccessful, will likely be at the center of what de Blasio must answer for when he faces state lawmakers next year. De Blasio said Wednesday that the city's test scores beat out increases seen in the state's other "Big 5" urban school districts and stressed that the city is closing its performance gap with schools across the state in general. "We now have the smallest-ever gap between New York City's scores and the rest of the state's scores," said de Blasio. "It's less than a one percentage point difference, and we intend to close that gap. This is an indication of how quickly things are changing in our schools." An administration press release on the scores said that they demonstrate "the effectiveness" of the "Mayoral Control system and strategies to raise achievement." Still, de Blasio downplayed the importance of "high-stakes testing" during the press conference, stressing instead the need to make sure children receive a practical education. "Our schools must deliver real preparation for the real world," he said. "Education determines economic destiny." De Blasio is likely to make his community schools push, whereby schools become hubs that provide social and medical services, central to his case for renewing mayoral control. Jasmine Gripper of the Alliance for Quality Education, a union-supported group with close ties to the mayor, said that test scores shouldn't be used as a measuring stick on de Blasio's success with mayoral control. "The data points shouldn't be test scores but parent engagement, the amount of [student] suspensions, and the improvements made at struggling schools." Gripper said AQE is paying attention to whether community schools are looking after the overall wellbeing of their students, examining the plans they submit to make sure students are getting eye exams and have access to guidance counselors and psychiatrists. "One year is just not enough time to see significant gains," said Gripper. "Three to four years would be more like it." But de Blasio doesn't have three or four years. Instead, he faces the potential political embarrassment of having mayoral control stripped away by his enemies, which could leave him extremely vulnerable during the next mayoral election, in 2017. That's why many Democrats and education advocates see the one-year extension as a political move that serves both as retribution for de Blasio's attempts to win the state Senate for Democrats in 2014 and to prevent him from getting openly involved in the 2016 legislative elections. Flanagan and Cuomo also both appear to be interested in quieting de Blasio's criticism of charter schools. "The grade-fixing scandal, along with the earlier attacks on charter schools, show exactly why we took such a cautious approach to mayoral control," Flanagan wrote in the Post. But mayoral control isn't as simple as one side against the other. Many Democrats in both the Assembly and Senate, who rallied to de Blasio's side last year to support a minimum three-year extension of mayoral control, do harbor major concerns about the system. Some of them are concerned about creating more checks and balances on the city Department of Education's spending, while others want to increase parental involvement while weakening the mayor's ability to make appointments to the Panel for Educational Policy. Sen. Diane Savino, of the Independent Democratic Conference, said she felt one year to show improvement in mayoral control is "reasonable." "It shouldn't be that hard," said Savino. "Since the inception of mayoral control we've had a host of issues raised every year by just about all the major Democrats, including the mayor himself. Just pick some of them and get to work." Savino, who said she hadn't read Flanagan's op-ed, said she wants de Blasio to get to work dealing with the grade-fixing scandal that sparked Flanagan's column. "What is a diploma worth when no employers take it seriously?" asked Savino. "We need to take action quickly against anyone who is rigging grades and we need to figure out what we are doing that leaves students without enough credits to graduate." The mayor and his schools chancellor responded to new grade-fixing allegations by creating a new task force within the DOE to investigate and uphold academic integrity. Supporters of de Blasio note that credit-recovery problems have been at play in city schools for years, if not decades, and that there are a relatively small number of students involved. Regardless, anything happening with city education is de Blasio's responsibility now. And the mayor has repeatedly argued that mayoral control makes clear that he is ultimately accountable for the city's schools, and that voters will hold him so come 2017. Savino and Flanagan both point to the fact that 77 percent of city high school students entering CUNY need remedial math or English. Savino said she'd like to bring CUNY officials to hearings on mayoral control to get their take on what kind of education city students are getting. "Test scores are just a piece of this," Savino told Gotham Gazette. "We need to involve CUNY because they are the best judge at whether we are providing our students with a sound education that holds up once send them out into the world." During Wednesday's press conference de Blasio was asked whether he felt pressure to accelerate improvements given that he will have to go back and face the legislature to win renewal in less than a year. The mayor responded that "since day one" he felt the pressure to improve the city's schools regardless of Albany. "So, no," de Blasio said. "The pressure I feel as the person accountable for our schools is to make sure our kids are getting what they need, and I'm accountable to their parents. That's my focus." Supporters of expanding free school meals in New York City are expressing mixed reactions to the city budget agreement announced by Mayor Bill de Blasio and City Council Speaker Melissa Mark-Viverito on Monday night. The fiscal year 2016 budget, at $78.5 billion of spending soon to be officially approved, satisfies one key demand of advocates – that of expanding "breakfast after the bell." The name refers to allowing students to eat free breakfast provided by the school in their classroom. The program will be funded for inclusion in 530 elementary schools. 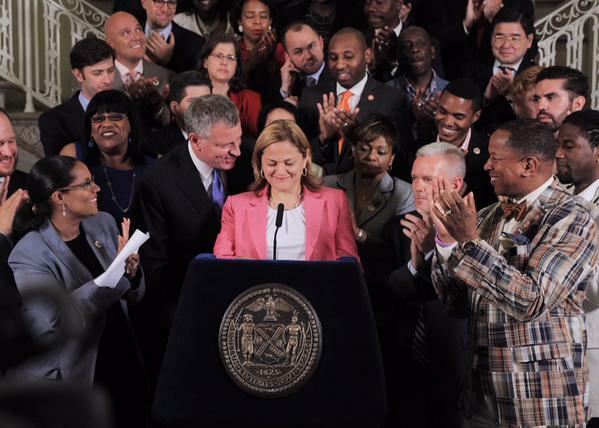 The budget also includes funding to continue universal free lunch in all of the city's standalone middle schools. But, this has disappointed advocates who were hoping the free lunch program would be expanded to elementary and high schools. This year's preliminary and executive budgets did not include 'breakfast after the bell' or an expansion of universal free lunch but the final budget includes $17.9 million to expand the breakfast program to 530 elementary schools. City Council leadership considers the expansion of 'breakfast after the bell' and the continuation of the middle school free lunch pilot program successes. A continuation of the middle school program was not included by de Blasio when he unveiled his February preliminary budget, but the Council convinced him to restore it in his executive budget, released in May. 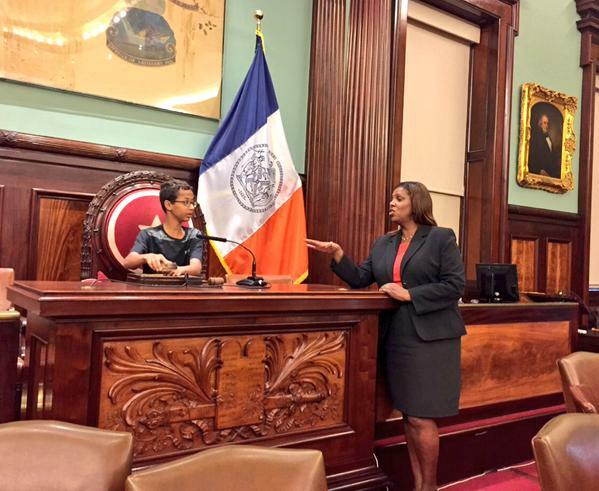 At the time, Mark-Viverito said, "Bureaucratic hurdles are not an excuse for letting children go hungry." In response to the budget deal, Council members focused on gains made, praising the 'breakfast after the bell' provision in the budget for reducing negativity around hunger for elementary school children. 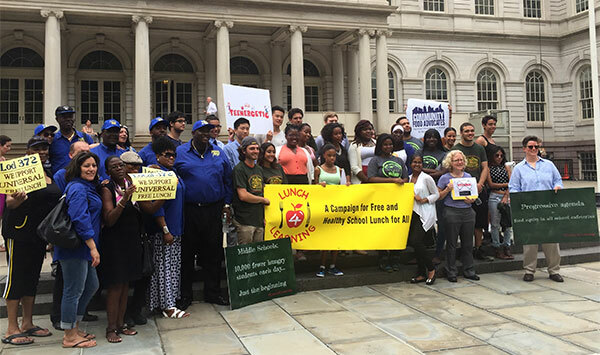 "Hungry kids will face less stigma at school because of $17.9 million for 'breakfast after the bell' for 339,000 children at 530 elementary schools, which I rallied for and introduced legislation supporting," said Council Member Ben Kallos in a post-budget statement. Kallos, a strong supporter of expanding free school meals, added that "New York City is now an important step away from being near last among big cities in public school breakfast participation." 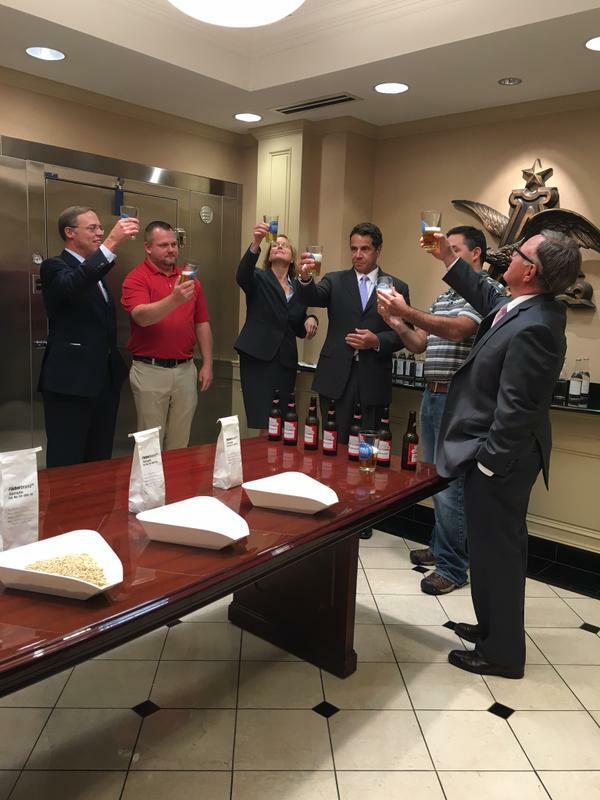 Advocates for 'breakfast after the bell' also welcomed the announcement. "New York City students were big winners in last night's budget deal," chief strategy officer for Share Our Strength, Josh Wachs, said in a statement Tuesday. "No child should start the school day on an empty stomach. Thanks to leadership from the Mayor, Schools Chancellor, City Council, and partners in the Powered by Breakfast NYC coalition, they won't have to in NYC public elementary schools." Through the budget, 'breakfast after the bell' will be expanded to include all of the city's elementary schools by fiscal year 2018. At the moment, it is an opt-in program in New York City with principals deciding if their schools participate. Over 300 of the city's schools have opted in so far, either serving breakfast in classrooms or providing "grab and go" carts for students to pick up food to take into class. At Monday night's press conference, de Blasio highlighted the role that the Council's insistence played and called breakfast an area where there was "opportunity for a major breakthrough" in fighting hunger and thus helping kids learn. As the expansion of 'breakfast after the bell' was celebrated, supporters of universal free lunch for all city students were less than satisfied. "I'm a little disappointed that it [universal school lunch] wasn't expanded," Public Advocate Letitia James told Gotham Gazette, while expressing satisfaction with breakfast program gains. "New York City should be leading the national conversation on improving nutrition in public schools but instead we're falling further and further behind." Other advocates echoed this sentiment. "We knew that the Council was championing this issue and that there seemed to be a lot of enthusiasm," says Liz Accles of Lunch for Learning, a coalition-led campaign advocating for universal free lunch. "We're a little stunned that it wasn't in there." Last year, the city introduced a pilot program under which standalone middle schools provided free lunch to all students. This increased school lunch participation by 10 percent in those schools. While the consensus among advocates was that these numbers were a success, Mayor de Blasio described the results as "mixed" at his executive budget presentation. The mayor reiterated that conclusion at Monday's budget announcement, saying, "The first year of the school lunch program didn't achieve what all of us had hoped." He added that the coming year would involve "a much stronger promotional effort and effort to engage parents and students." It appears that if the middle school lunch program shows enough progress there may be room for expanding free lunch beyond those grades. "It's an opportunity that's being passed up," says Accles. "The federal government wants us to do this," she said referring to federal reimbursements for meals served in public schools. Public Advocate James pointed out that because most expenditures would be covered by these reimbursements, it would only cost the city $20 million per year to provide free lunch to all of the city's public school students. This amounts to 0.1 percent of the Department of Education's annual budget. The drive for universal free lunches and 'breakfast after the bell' has been in large part due to a poverty stigma associated with accepting free school meals, long-offered to students from the poorest households. Around three-fourth of New York City's public school students qualify for free or reduced-price lunches on the basis of a family income below 130 percent of the poverty level, or other criteria such as being food stamp recipients, homeless, or in foster care. Despite the great need, stigma and a fear of being mocked limits student participation in free meal programs. A third of the students who qualify for free or reduced-price lunches don't eat those meals, with participation dropping below 40 percent in high schools. "Given those numbers, I'm really shocked that the mayor did not support expanding free lunch," says James. Breakfast participation is even lower despite breakfast being free for all students in New York City public schools since 2003. Morning food has been offered before the start of school. Last school year only about 35 percent of the city's low-income students were eating breakfast in school, according to the latest annual report by the Food Research and Action Center, a nonprofit organization working to eliminate hunger and under-nutrition. A combination of factors, including the poverty stigma and logistical problems in getting to school much earlier than the start of the school day, drive down breakfast participation numbers. Supporters of universal free school meals say that there would no longer be stigma attached to accepting a school lunch if schools provide free lunches to all students and family income is no longer a deciding factor. Similarly, if all students are allowed to eat 'breakfast after the bell' together in their classroom, it would not single out those students who have to arrive to school early just to eat a free breakfast in the cafeteria. The budget decisions that will dictate spending beginning at the July 1 start of the next fiscal year come as this school year is coming to a close. On Wednesday, the Department of Education announced that its "2015 Summer Meals program, which provides free, healthy breakfast and lunch to children across New York City, will begin this Saturday, June 27, the first day of summer vacation." The program is aimed at students who are food insecure and rely on school meals throughout the year. From the end of June through September 4, the program will provide free meals to "children 18 and younger" at "1,100 locations, including pools, school, libraries, parks, public housing sites, and community-based organization sites." Children don't have to prove New York City residency or be enrolled in summer school; no application or identification is needed to access food. The DOE said that "a record 8.1 million meals were served" last summer. Advocates want to see something similar all year round. On Tuesday afternoon, students from Lunch for Learning coalition groups delivered a letter to the mayor and a photobook of 330 pictures from its selfie campaign. They were accompanied by advocates, Council Member Antonio Reynoso, and leaders from Local 372, a union of the city's Board of Education employees. Barbara Turk, the mayor's director of food policy, was at City Hall to receive the letter and photobook on the mayor's behalf. The message of the student letter was clear: "We are disappointed that expansion of Universal Free School Lunch for all public schools was left out of the budget. We have been working very hard to make this happen and were surprised and upset when you said the middle school results are mixed." "If I get on line, the rich students will say that I'm eating 'free-free,'" said 16-year-old Aminata, one of the students at City Hall representing Bushwick Campus Youth Food Policy Council. While she has to try to hide when she gets a free lunch at her high school, she says that her brothers in middle school do not have to worry about bullies in the cafeteria because everyone in their school eats free lunches. She often also has to share her free lunch with friends who don't qualify for reduced-price lunch but still cannot afford to buy food every day. "This is not a want, this is a need," said Shaun D. Francois I, president of Local 372. Though they are disappointed by the budget, supporters of universal free meals, including the public advocate, plan to carry on their efforts to expand the program to all of the city's schools. "We're going to continue to campaign and we're going to continue to keep the pressure on, working with advocates to expand this program so that students will be better nourished ready for the school day," James told Gotham Gazette. "We know it's the right thing to do," says Accles. "We're going to keep pushing until we get it done."